The Richard Evans Award is presented by QAHN each year to a group of volunteers who, collectively, have contributed to preserving or promoting their community history, including some aspect of Quebec’s Anglophone heritage. 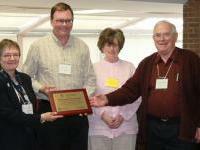 This year, this award is being presented to the Gatineau Valley Historical Society (GVHS). 2012 marks the 50th anniversary of the founding of the GVHS, whose mission is to promote the history and heritage of the Gatineau Valley. The founders of this organization have been involved in many dynamic projects over the years, including playing a leading role in the Fairbairn house project. The GVHS has organized local historical walking tours; an annual “Heritage Paddle” down the Gatineau River culminating in a lumberman's supper and historical display; a community Remembrance Day ceremony; and an annual antique auction. In Cantley, La Pêche, Chelsea, and Wakefield, the GVHS has assisted with descriptions of historic houses and the installation of plaques. The GVHS has been active in the ownership and maintenance of the Chelsea Pioneer Cemetery. And members of the historical society founded the Old Chelsea Protestant Burial Ground Committee which works with the municipality to support that 200 year old site. The Gatineau Valley Historical Society has collaborated with other groups in local anniversary celebrations (Low) and assisted new groups (Cantley 1889) to set up their own organizations. There have been displays for libraries and other public places, school projects in local communities, and loans of artifacts to organizations such as the Logue Museum in Maniwaki and the Aylmer Heritage Association. For the past 38 years, the GVHS has published Up the Gatineau, a local historical journal to which over 120 authors have contributed. And finally, the Gatineau Valley Historical Society maintains an excellent archive at the municipal library in Chelsea. Volunteers respond to research inquiries in person, by email or by telephone. For more on the GVHS, visit www.gvhs.ca.